I've watched Kori do Friday Fragments every week and thought about participating many times, but this is my first week! Friday Fragments are bits and pieces of your week that are usually brief; too short for a stand-alone post, but too good to discard. Collect humorous observations, "Heard" items, and other small gems and put them together in a Friday Fragments post. Friday Fragments are the brainchild of Mrs.4444 and you can find more at Half Past Kissin' Time. *** First off, I'm sorry I haven't posted anything this week. I have about 15 posts in my head and just haven't had the time to sit down and actually write them. If you haven't heard, we got GREAT news on Tuesday - the job that Justin was waiting to hear back on came through! He will be officially starting sometime next week, although he's actually been there a few days this week already. We are super excited about it and there's a whole post there, probably up sometime next week. I hadn't posted anything about it here b/c Justin has a post in mind he wants to write, and I've been waiting for him to have time. I'll make him do it over the weekend so next week we can get back on schedule! *** I am giant. I will be 35 weeks pregnant tomorrow and gained 2 lbs in the past week. What?! More about all of that next week, for now I'll just say I'm sort of sedentary and exhausted and feel humongous and slightly unweildy. Also, my hormones are completely out of control. *** Driving around on Wednesday while Sam was at school, I saw two different people who I just looked at them and felt instant dislike because I could tell how COOL they thought they were. The first was a hipster type, jacket, scruffy, sunglasses. The second was a 'gangsta' type with clothes 3 sizes two big and a swagger no doubt caused by trying not to have his pants fall off. *** If I had the money and occassion to buy a fancy new sportscar? I would totally get one of the new Camaros. I saw one last week on Human Target, then saw one driving around and I think they are soooo pretty. You can tell I'm a girl because I just called a car pretty. *** Sam's Grandma and Grandpa are teachers and were both on Spring Break this week. My mom bought him a climber, and Grandpa Paul put it together this week. 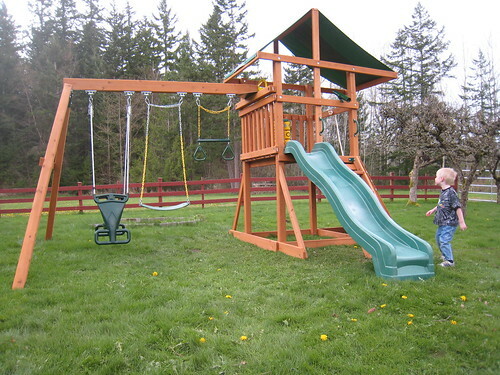 I see HOURS of fun in our future, and can't wait to have other kids over so Sam can play on it with his friends. *** I have been feeling a little bit bummed about the meetup group that I'm running. I took it over from a friend a few months ago because she just couldn't fit it in anymore, and attendance has pretty much sucked. For the 15 or so playdates/outings we have scheduled in April most of them only have me and 1 other person saying they'll come. It used to be so great to have playdates to look forward to every week where I could relax and Sam could play. I miss my old friends who I used to see every week, and our Moms Nights Out. I don't really know what to do about it, I just sent out an email to all the members asking what would help, but haven't gotten a huge response so far. Right now I'm just feeling like it's a lot of effort to keep so much time clear on my calendar, to spend time finding new things to do, and have no one show up. So, I guess we'll see. *** I am looking forward to this weekend, we are heading down to Seattle for Easter Brunch with friends, and I'm going to get to meet my friend Tara's baby boy for the first time! I can't wait. I've also got plans with friends Saturday night for one of their birthdays and I'm looking forward to seeing people. We have not made up an Easter Basket for Sam yet, I guess that's on the list for today or tomorrow. *** I just finished reading "The Girl with No Shadow" by Joanne Harris. She is one of my favorite authors, and this one is a continuation of the story she started in "Chocolat." I HIGHLY recommend her books, I loved this new one and "Chocolat" as well as "Five Quarters of the Orange." I read this one in only a couple days when Sam was at his Grandma's house last weekend and couldn't put it down! Now I'm reading "Sati" by Christopher Pike, which has been on my list for quite a while. Next I need to tackle "The Happiness Project" by Gretchen Rubin for book club later this month. *** Have you seen those commercials for Kool Aid Fizzers? Does anyone else find it totally creepy that it shows all these little creatures/organisms swimming inside the Kool Aid? Also, those Wheat Thin commercials where that handsome, fit black man dives through the air to crunch on a Wheat Thin? Totally weird. *** I was writing this post and blogger said it wasn't autosaving, then I copied it just in case, but forgot to paste it into notepad, and copied and pasted something else. When I tried to publish, blogger was down. I thought I lost it but when I was finally able to log back in, almost everything I'd written HAD saved somehow. Whew! *** Sam had his first dentist appointment on Thursday. Yes, he is almost four years old. Shuddup. He got his X-Rays and did a really good job! He does not have any cavities, just one spot that we need to make sure to keep clean. I also think that having gone to the dentist will make him more willing to have his teeth brushed, it was certainly easier this morning! Yay! I am so grateful to hear that Justin got hte job; I have been thinking about you all, and hoping/praying something would fall into place for him. The LAST thing any of you need at this point in time is more stress and worry. The climber looks like SO much fun; I wish we lived closer, I would totally come to your house for playdates. Sam and Owen could play outside and I could coddle the new baby while you SLEPT. Congrats on your husband's job!! What a relief, huh?